A man's body has been recovered from a car which was on fire in Renfrewshire. Emergency services were called to the vehicle blaze on Row Avenue in Renfrew at about 22:30 on Monday. 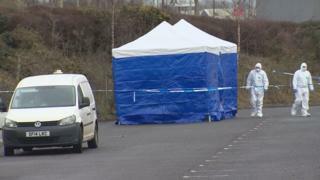 A police forensic tent was erected near the Harmony Row football pitches near the Braehead Shopping Centre by Tuesday morning. Police said they were trying the identify the man and his death was being treated as unexplained. A post-mortem examination will be carried out. A police spokeswoman said a report would be submitted to the procurator fiscal. It comes just weeks after the body of a man was found in a burned-out Mercedes in Blantyre. Police later identified him as 36-year-old Polish national Rafal Michal Lyko.